Death Packs a Suitcase is a spy thriller written by Bryan Edgar Wallace, the son of Edgar Wallace. The younger Wallace had a reasonably successful writing career but is now entirely forgotten in English-speaking countries. His books have however been the basis of many movies, almost entirely in Germany. When the German Rialto studios started to enjoy enormous success with their adaptations of Edgar Wallace thrillers, known as krimis, at the beginning of the 1960s other German studios wanted to get in on the act but they couldn’t always secure the rights to Edgar Wallace’s books. They came up with a brilliant solution - they’d do adaptations of his son’s novels instead. The similarities of the two writers’ names was a major attraction and as a result many of Bryan Edgar Wallace’s books were filmed. Bryan Edgar Wallace’s novels are not easy to find these days but I did track down a copy of Death Packs a Suitcase, written in 1961. It’s more of a straight spy thriller than his father’s books and it has a Cold War background which you won’t find in any of Edgar Wallace’s story since he died in 1932. The Russians have developed a new multi-megaton nuclear bomb which is so small it will fit into a suitcase. In fact to demonstrate its compactness they’ve actually placed it into a suitcase. They’re feeling pretty pleased with themselves until a British spy named Tom Pringle steals their new suitcase atom bomb. Pringle also steals a twin-engined Russian bomber in which to make his getaway. He’s approaching the West German frontier when he receives a radio message changing his landing instructions. Just as he crosses the border he is shot down by a pursuing Russian MiG-19. He ejects and lands safely just inside West German territory where he is met by his contact. Pringle has a nagging feeling something is wrong, and he’s right. He is shot dead and the suitcase is stolen. But the suitcase was not stolen by the Russians. In fact nobody knows who has stolen it. British intelligence are very upset, and so are the Russians. The suitcase has been stolen by a mysterious criminal gang. They intend to sell it back to the British, for 15 million pounds’ worth of uncut diamonds. If the British fail to meet their price they will blow up London. Eight million lives now hang in the balance! British intelligence must find the suitcase. Their top agents, including Bill Tern, are put on the job. They also call in Scotland Yard to help them, in the person of Chief-Inspector Quil. This is one of the ways in which this is a slightly unusual spy thriller - one can’t really imagine James Bond’s boss M calling in the police to help 007 on a case. The result is a mixture of spy thriller and police procedural. It’s rather like a cross between Edgar Wallace and Ian Fleming. This is an angle that would certainly have appealed to the German makers of krimis who always liked to have a Scotland Yard inspector as the hero. Bill Tern soon comes across an unexpected and unwelcome lead. Anything or anyone that has been in contact with the suitcase will be slightly radioactive and he discovers that his girlfriend Susan’s cigarette lighter is in fact slightly radioactive. Could Susan be involved in this appalling conspiracy? Susan has her own problems. Her father has been roped into a shady business deal by a smooth financial operator and then her father disappears. Bill can’t see any way there could be a connection, expect for the annoying fact of that radioactive cigarette lighter. And Susan has other worries as well since she’s been warned that Bill Tern is a secret communist. Could Bill be involved in the theft of the bomb? Or could he be working for the Russians to recover it for their side? The British authorities don’t want the bomb in the hands of an insane criminal but they don’t want the Russians to get it back either. Chief-Inspector Quil is meanwhile conducting the case as a regular criminal investigation, but one with very high stakes. And he keeps coming up against dead ends. Literally so - everyone who might be able to provide a lead seems to end up dead. And time is running out. I’m not going to suggest that this is one of the masterpieces of the genre but it’s an entertaining and enjoyably outrageous tale. Bryan Edgar Wallace inherited his father’s penchant for complicated plots and while he doesn’t quite have his father’s skill he can still spin an engaging yarn with plenty of twists and turns and plenty of action. This is a book that will probably appeal most to fans of the German krimi movies but if you’re in the mood for a slightly unconventional tale that mixes crime and espionage it’s worth a look. I haven’t read any Agatha Christie for years but since I’ve started watching the BBC’s Poirot TV series my interest has been rekindled. 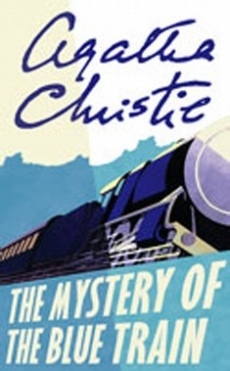 So I’ve just read The Mystery of the Blue Train, a Poirot novel from 1928. And it was quite a pleasant surprise. Christie’s style was less clunky than I’d remembered it and there was some sly humour. David Suchet’s portrayal of the great Belgian detective has helped me to warm towards the character quite a bit and I don’t find Poirot annoying at all. Plus you just can’t go wrong with a murder mystery where the murder takes place on a train. Not one of these modern horrors but a real train, the sort that has sadly disappeared from our depraved modern world. Of course with Christie you expect ingenious plotting, and you get it. Overall an enjoyable read and I’m now on the lookout for more early Poirot in the local second-hand book shops. Abraham Merritt (1884-1942), usually known simply as A. Merritt, was one of the more interesting American pulp writers of horror and fantastic fiction. 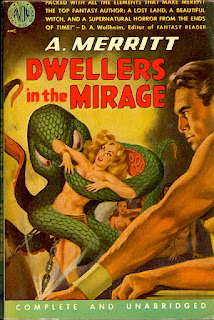 Dwellers in the Mirage was one of several “lost world” novels that he wrote and as usual he gives the sub-genre his own distinctive twists. Leif Langdon is an engineer and with his yellow hair and huge build he’s a genetic throwback to his family’s Viking forebears. He’s more than simply a physical throwback however as will soon become evident. On an expedition to the Gobi Desert he discovers that he has a kind of race memory of his distant ancestors and with his Viking blood he shares a racial ancestry with the Uighurs of the Gobi. The Uighurs, like Leif, trace their ancestry back to the Asiatic ancestors of the Vikings. An encounter with an Uighur high priest reveals to him that he is in fact Dwanayu, a warrior king from the distant past. He is not a reincarnation of Dwanayu as such but he shares Dwanayu’s memories of his glorious past and like Dwanayu he has the power to call up the god of all gods, the dreaded Khalk’ru. Khalk’ru is the source of the myths of the Kraken, the twelve-tentacled octopus god-monster. Khalk’ru is the god of the void, the eternal nothingness, the enemy of all life. Khalk’ru turned against his people and made their world a desert but the ancestral race not only survived, they migrated. And not just to Scandinavia. On a later expedition to Alaska with his Cherokee companion and blood-brother he discovers a strange lost world, the world of the dwellers in the mirage, the Shadowed-Land. A hidden valley reveals an eerie mystery. Freak atmospheric and geological conditions have cloaked this valley in a mirage. Leif and his companion see a glacial valley and a lake, but which is the reality and which is the mirage? In fact both are mirages. Underneath a layer of green mist is a lost world. It is a world inhabited by several races - the golden pygmies known as the Rrrllya and a tall red-haired warrior race known as the Ajvir who are their sworn enemies. Leif will meet two women, the beautiful Evalie who is a kind of queen to the Rrrlyya although she is not of their race, and the equally beautiful but cruel Witch-Woman Lur of the Ajvir. He will discover his destiny as Dwanayu but is it a destiny that Leif Langdon can accept? And can he accept the awful Sacrifice on which this works depends? He will find war, and love. But can two men inhabit the same body, and can two women share the same man? Merritt’s lost worlds are more than just lost worlds of prehistoric creatures. He had the ability to create strange and alien civilisations and to portray the clash of conflicting civilisations. Published in 1932 the book draws on many of the ideas that were popular at the time - the unconscious, hypnotism, race memories and civilisations in deadly conflict. Merritt was also a skilled and entertaining story-teller. He could create memorably strong female characters and there is more than a tinge of destructive and obsessive eroticism. The book also has some affinities with sword & sorcery genre. There is action and there is magic, there are strange gods and stranger beliefs. Fans of both weird fiction and sword & sorcery will find much to enjoy in this brilliant and adventurous tale. Highly recommended. 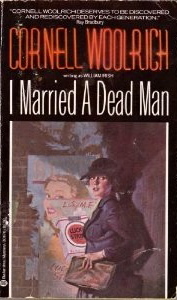 I Married a Dead Man is one of Cornell Woolrich’s best–known crime novels. The plot is convoluted but it works like a well-oiled machine. The central character is the woman who marries a dead man, but I won’t spoil it for you by explaining how she does that. The focus is very much on her, and the psychological stresses on her in her very peculiar situation. Woolrich makes a somewhat unlikely scenario seem totally plausible. And he gives us characters to care about – they’re not bad people, they just find themselves in a uniquely difficult situation from which they have to try to extricate themselves. There are also some very nice plot twists, and they’re twists that seem believable. The only other Woolrich novel I’ve read, The Bride Wore Black, was just as ingenious but in I Married a Dead Man he pulls all the pieces together much more successfully. 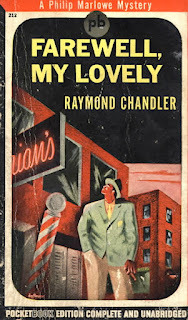 Farewell, My Lovely was my introduction to the work of Raymond Chandler, and in fact it was also my introduction to the American hardboiled school of crime writing. Within a few pages I was totally hooked by Chandler’s prose. Revisting the book I liked it even more, which I think is the mark of a great crime novel. I also quickly became fond of Philip Marlowe, and was pleasantly surprised to find that he wasn’t a mere tough guy. In fact he’s a delightful mixture of tough guy and sensitive guy, of cynic and idealist. And Chandler makes that combination of qualities believable. The plot was fiendishly complex, but I’ve now come to the conclusion that it’s best not to get overly worried about all the twists and turns of Chandler’s plots. It’s the style that matters, and the character of Marlowe. Mind you, this one has some great supporting characters as well, like Velma and Moose Molloy and in fact even the minor characters are fairly memorable. Chandler’s great strengths were his characterisation and his dialogue, both demonstrated to great advantage in this book. 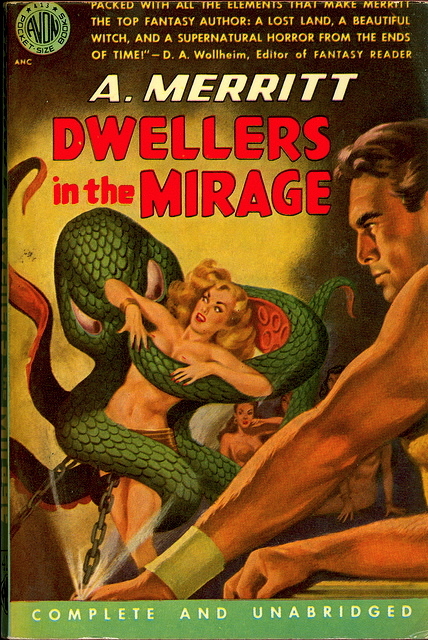 This was Chandler’s second Philip Marlowe novel, published in 1940, a year after The Big Sleep. 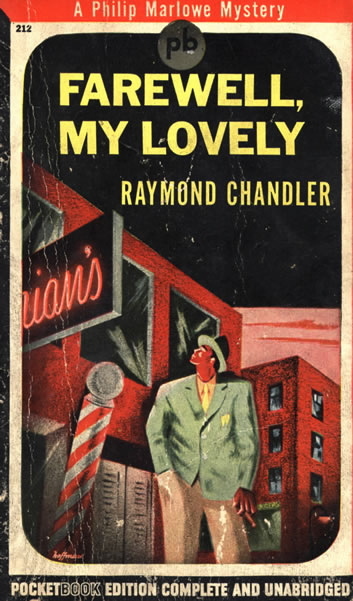 It helped to consolidate Chandler’s reputation as the best of the up-and-coming hardboiled crime writers. Farewell, My Lovely remains, deservedly, one of his most admired novels. It’s been filmed three times and at least two of the film versions (from 1944 and 1975) are classics. It’s crime writing of a very different type compared to the English school of detective fiction – Chandler is at least as much concerned with social commentary as in setting the reader a puzzle to solve. Farewell, My Lovely is still one of my favourite crime novels.